The global point of care diagnostics market is growing at a healthy CAGR. It is expected to receive a boost during the forecast period, taking the market evaluation US$11.7 bn by 2024 end. The market witnesses increasing advancements and investments in products, driven by a robust competition. 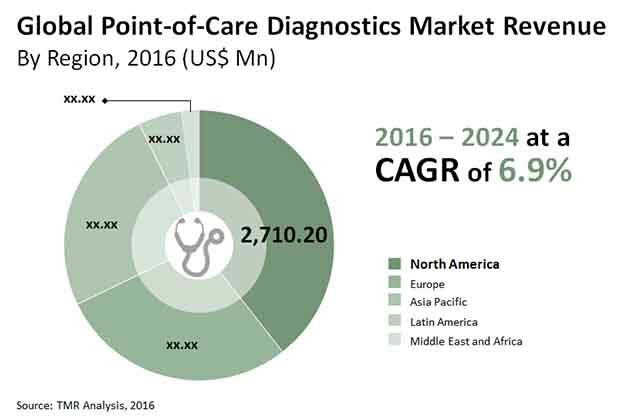 The key players in the point of care diagnostics market are Alere Inc, Becton Dickinson and Co., Abbott Inc., F. Hoffmann-La Roche Ltd., and Teleflex, Inc. Leading players in the marketing are increasingly pursuing new and emerging markets to expand their operations. These new and unexplored regions include various countries in swiftly developing parts of Asia Pacific, Latin America, and Africa. The market was evaluated at US$6.8 bn in 2016, which is expected to rise to US$11.7 bn by 2024 end. The point of care diagnostics market serves patients with a number of other life threatening diseases. Among these infectious disease, Ebola, HIV, swine influenza have made headlines all around the world recently. Their growing threat and inadequate resources in developing countries is expected to expand the point of care diagnostics market during the forecast period. North America held 40% of the global point of care diagnostics market in 2015. The region is expected to hold its leading market share during the forecast period, driven by increasing number of diagnostics as well as high income. The market is expected to receive a boost by factors such as growing cases of substance abuse, advancements in testing equipment, and minimally invasive nature of equipment. Credible and value-driven legislation is expected to boost market growth of the point of care diagnostics market. Good administrative regulations such as Clinical Laboratory Improvement Amendments (CLIA) have earlier led to the increase in the sales of PoC equipment. The regulations are expected to lend credibility as well as assurance to consumers in the market. Additionally, increased in funding by government agencies such as Department of Defense, Bill and Melinda Gates Foundation and NIH are also expected to drive the growth of the point of care diagnostics market during the forecast period. These organizations have also led funding for R&D in various institutes like Dartmouth College, California Institute of Technology, Seventh Sense Biosystems among others. Home testing equipment for glucose measures the level of sugar in the blood circulation. The new equipment in the market is reliable as well as cost-effective. These gadgets are transforming the health industry with growing digital collaboration between patient and doctors as well as routine prescriptions. The increasing popularity of this equipment is a major driver for many diagnostics firm, which have adopted the new standard. The shortened duration of care, its cost-effective nature, and consistent care support is making it a key trend emerging in the point of care diagnostics market.